Terex AWP’s Genie SX-180, the world’s tallest self-propelled boom lift, provides unmatched platform height and horizontal outreach, and stows into a tight package. In January, Terex AWP, Redmond, Wash., will begin full production of its new Genie SX-180 telescopic boom lift, the world’s tallest self-propelled aerial work platform. Terex unveiled a prototype in April 2013 at the Bauma trade show in Munich, Germany. It then spent nine months field testing and making improvements before beginning full-on manufacturing. The SX-180’s 180-ft. maximum platform height, 80-ft. maximum horizontal reach, unrestricted 750-lb. lifting capacity, and ability to travel at full height make it productive in a wide variety of applications, from commercial and infrastructure construction, to oil and gas work, industrial construction, general maintenance, and ship care. Frank Schneider, super booms product manager for Terex AWP, says that in addition to outperforming other self-propelled boom lifts, the SX-180 can do some work now being done by big truck-mounted aerials or cranes, while costing one-half to one-quarter the purchase price of those kinds of equipment. He adds, “Some customers tell us they won’t even buy a 100-ft. boom lift anymore because a 125-ft. model doesn’t cost that much more.” The SX-180’s capability is, of course, a huge leap above either of those models. But even though its maximum height is impressive, Schneider says that another aspect of its performance is just as important: its ability to reach out 80 ft. horizontally with the platform 112 ft. above ground and still deliver 750-lb. or three-person platform capacity. One key market for the SX-180, says Schneider, is the rental industry, which will particularly appreciate the unit’s 54,000-lb. total weight and ability to ship on a standard 8'2" wide trailer without over-width or over-height permits. The machine’s total shipping envelope measures 42'7" long, 8'2" wide, and 10'0" tall. “Getting an over-weight permit is not generally a big deal; getting a wide-load permit can be,” says Chad Cochrane, general manager of U.S. Markets Inc., a national leader with a fleet of some 400 boom lifts and telehandlers that it supplies to equipment-rental companies for re-renting to end users. 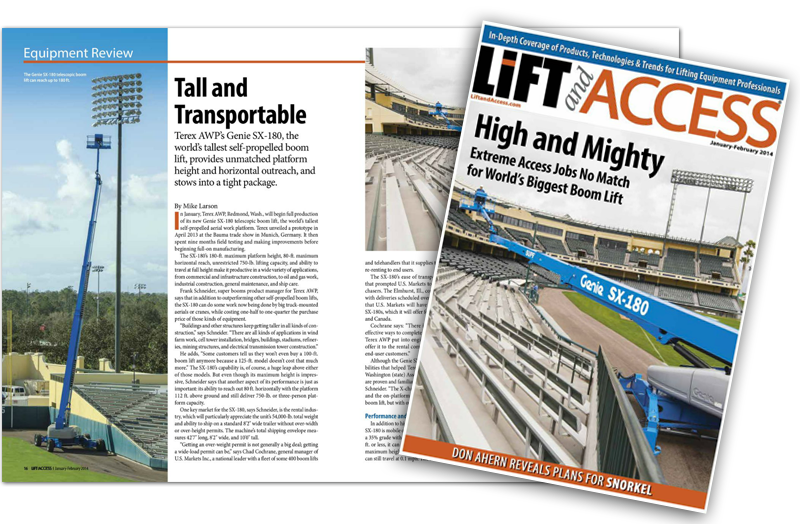 The SX-180’s ease of transporting was among several features that prompted U.S. Markets to be among the boom lift’s first purchasers. The Elmhurst, Ill., company has ordered several SX-180s, with deliveries scheduled over the first half of 2014. Cochrane says that U.S. Markets will have the industry’s largest fleet of Genie SX-180s, which it will offer for re-rent throughout the United States and Canada. Although the Genie SX-180 offers some unique designs and capabilities that helped Terex AWP win an innovation award from the Washington (state) Association of Business, many of its components are proven and familiar designs used on previous Genie models, says Schneider. “The X-chassis is the same used on the ZX-135 boom lift, and the on-platform controls look like those on the popular S-60 boom lift, but with only one extra switch,” he adds. In addition to high vertical reach and long horizontal outreach, the SX-180 is mobile on a jobsite. It can travel at up to 2.5 mph and climb a 35% grade with the boom stowed. With the platform raised to 125 ft. or less, it can travel at 0.4 mph, and with the platform at 180-ft. maximum height and the turret swung to any position, the SX-180 can still travel at 0.1 mph. The chassis has 1'3" of ground clearance. Although Genie recommends using a spotter, the SX-180 can be set up and operated by one person in less than 10 minutes from arriving on a jobsite. A major reason for the SX-180’s ability to provide outstanding reach, easy shipment, and fast setup is its patented X-chassis, whose swing-out axles provide a 16'6" wide base during operation and swing back in line with the chassis to achieve the 8'2" shipping width. The four axles mount to the corners of the chassis’ center section with heavy hinge pins. The axles are swung in and out by hydraulic cylinders, which also lock them in place. During axle positioning, yokes automatically turn the wheels to minimize tire scuffing. The SX-180 operates in four-wheel drive all the time, with positive traction drive, and the operator can switch between four steering modes anytime: two-wheel front, two-wheel rear, four-wheel circle, and four-wheel crab. The minimum inside turning radius is 9'11". During operation, no wheel sees more than 29,000 lbs. of down force, even when the platform is at maximum outreach over one corner. The hydraulic travel drive uses a two-speed motor to power each wheel. The motors are mounted at the wheel locations and each wheel is equipped with a spring-applied, hydraulically released parking brake. Foam-filled tires are standard, with solid-rubber tires optional. The travel system’s solenoids, valves, and other components housed inside the chassis are located in easy-to-reach locations and protected by easily removable bolted covers. The machine is powered by a 74-hp diesel engine. Customers can choose a Perkins or a Deutz. Either engine meets Tier 4 Interim emission standards. About mid-year, Terex AWP will begin using Tier 4 Final-compliant engines from those same two manufacturers. The Tier 4 Final engines will use exhaustgas recirculation (EGR), a diesel oxidation catalyst (DOC), and a diesel particulate filter (DPF). No selective catalytic reduction with urea (SCR) will be needed. The power plant is mounted in the turret on a swing-out base for easy access to all components and service points. Two Sauer hydraulic pumps produce ample flow for true simultaneous multi-function operation. They also drive a 7.5-kW onboard electric generator, which comes standard, or an optional 12.5-kW generator. The hydraulic system operates at 2,900 psi. The fuel tank holds 50 gal., enough for about 17 hours of typical operation. The hydraulic reservoir holds 110 gal. The hydraulic system includes three points of filtration for maximum fluid cleanliness and reliability. The system also includes a quarter-turn valve that can isolate the hydraulic system from the reservoir. The swing system provides unlimited continuous swing. A large-diameter shear-ball bearing, often called the slew bearing, connects the turret to the chassis. Its mounting bolts are easy to access from the top, and its lone grease fitting is also easy to reach. Hydraulic swing power comes from two hydraulic slewing motors, whose pinions engage teeth on the ring gear. The SX-180’s swing drive is unique in that the two motors are mounted side-by-side and provide double the tooth contact area of a single-drive system. The side-by-side mounting simplifies servicing and reduces the number of hoses needed. Both motors are protected by a steel plate. Turret tailswing is just 3'9". For transportation, the turret can be locked in position with a drop-in pin. The five-section, fully proportional, telescopic boom is designed for strength, stiffness, smooth operation, and easy maintenance. Each of its five 39-ft. sections is a welded box-section structure. The four extending sections slide smoothly on ultra-high density composite slider pads that never need lubricating. The extension and retraction system uses a single hydraulic cylinder and wire ropes. For easy inspection and servicing, the entire system is encased in a cartridge that slides out the back end of the boom as a unit. “You just disconnect the hydraulics and sensors, remove a couple of bolts, and it slides right out,” says Schneider, who adds that two people can remove it in less than three hours. Boom raising and lowering are done by a single hydraulic cylinder. The 10-ft., single-piece articulating jib lets users position the platform in the optimum location to work comfortably and efficiently. It is mounted to the boom top with a small slewing bearing and worm drive that never needs backlash adjustment and delivers a solid feel for users. The jib can rotate vertically from 60° below horizontal to 75° above, as well as 180° horizontally. The SX-180 uses Genie’s standard 3'x8' steel work platform. Mounted to the end of the jib, the platform is self leveling and articulates 160° horizontally for precise placement. The single front entrance is standard; a tri-entry platform, optional. Also standard are a 120V power line to platform and a mount near the platform for a welder. An air line to the platform is optional. Terex AWP’s Schneider says that operators who have used other Genie boom lifts will find the SX-180’s control system virtually the same as that used on the S-60, S-80, Z-80, and ZX-135. The machine is fully computer controlled using a CANbus system. All functions operate with fully proportional Hall-effect joysticks and all controls are programmable to meet user preferences. Telematics are not standard, but can be added as an option at a customer’s request. The controls include Genie’s drive-enable system, which requires the operator to acknowledge the turret position before traveling the machine. Even as the new high-reaching model SX-180 begins making an impact on jobsites in North America, Schneider says Terex AWP has more new products on the horizon. “Some are already defined and in development. Others are still very conceptual—but they are all definitely on the way,” he says.